Summary: How much does a barn conversion cost, average labour costs and average material costs. In recent years it has become very desirable to live in a more rural setting. For many the thought of buying an old run down barn and converting it into a modern, comfortable home can be very appealing. Many who have downsized from the "Big City" have done so very successfully, however, these projects have many hidden costs and plenty of issues to consider before signing on the dotted line. When searching for a barn to buy, you will usually pay a premium for barns which have already obtained planning permission. Consider whether it is worth paying the extra for this and how similar the approved plans are to your own ideas for the building. Also the land which goes with the barn will command a premium, so consider just how much space you need. For most families 1/4 acre will be ample. If the barn of your dreams comes with 5 acres, consider whether you can rent out some of the land, or sell it on to cover some costs. Check if there are any utilities on site and if not how difficult it will be to get them there. Many barns are in remote locations so mains gas and sewerage may not be an option. If this is the case, consider the implications of the final running costs and investigate options for alternative technologies. 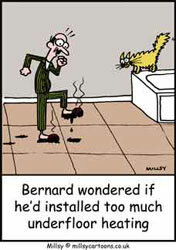 It will also often help with planning permission if the planners can see you have designed in low carbon technologies. When applying for planning permission you will need to use some architectural services to help construct the plans. If you are project managing the build yourself, you could get away with using a less costly architectural engineer rather than a full architect. However, this can lead to problems later on as you may end up needing to employ other building professionals such as structural engineers to carry out work an architect would have done as part of a package. Some architects offer services at a set fee or a prearranged amount and some will work at an hourly rate. This can be useful if you only require minimal involvement from the architect in the early stages. Finally consider the finishings you are using. If the property is to be your family home for life, you will want to use the best finishings available. However, this doesn't always mean using the most expensive. If you are converting the property to sell on later, you might want to opt for less costly items to help keep the overall build price in check. When applying for planning permission you will need to use some architectural services to help construct the plans. Many barns are in remote locations so mains gas and sewerage may not be an option. One of the big initial costs is wrapped up in the purchase of the barn itself. As many barns available for conversion stand on a sizeable plot of land, they tend to attract a sizeable price tag. For a basic barn with around 1/4 acre of land £150,000 is not uncommon and for a barn with planning permission in place it is likely to be closer to £200,000. Also to consider are any solicitors' costs, agents' fees etc. Barns located in expensive areas of the country or with substantial plots of land included in the sale can be considerably more than this. Pricing for architects is tricky as the RIBA (The Royal Institute for British Architects) abolished scale rates several years ago. Rates are now subject to market forces and not as transparent as they once were. As a rough guide you can expect to budget between 6% and 15% of the overall project cost. The cost of the actual conversion will largely depend on the size of the barn you are converting, the specifications and finishing you are using. In addition the amount of structural work required, particularly to the roof and foundations, prior to starting the conversion needs careful consideration. A good way to look at price of conversions is to price the job per square metre of floor space (in the finished building). Carrying out work yourself can significantly reduce the overall cost of the project. A rough guide price for the total cost of a conversion starting with a barn having sound roof and walls, with utilities on site, no underpinning required and fairly standard finishes could be as little as £800 per m2. A building requiring more structural work to begin with and with a higher specification of finish is likely to be in the region of £1000 - £1200 per m2. Top quality restorations can however cost as much as £1500 per m2. Pricing for architects is tricky as the RIBA (The Royal Institute for British Architects) abolished scale rates several years ago. If you are converting the property to sell on later, you might want to opt for less costly items to help keep the overall build price in check.